Palmer Engineering was selected to design the Wolf Run Watershed Water Quality Improvement Projects for the Lexington Fayette Urban County Government. The project began design in February 2015, with a short design period to meet grant requirements. The project consists of two individual improvement projects within the drainage basin. One project, Cross Keys Park, includes the improvements to the existing Cross Keys Park pond. 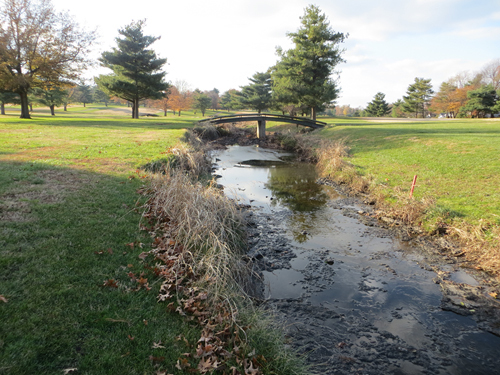 The other project, Picadome Golf Course, includes stream restoration of Vaughn’s Branch and Big Elm Tributary on the golf course property. The Cross Keys Park includes a large pond that is located in Lexington on the Gardenside Tributary, which flows into Cardinal Run and eventually Wolf Run. The current pond surface area is over 4.0 acres and covers about one-third of the park area. The pond is over 40 years old and is highly degraded due to excessive siltation. Average water depth is now two to three feet deep over most of the pond. In particular, the upstream half of the pond is excessively silted in with only one to two feet of depth, providing no aquatic habitat. The pond’s principal spillway is a single concrete broad-crested weir and serves also as the emergency spillway. The conditions of the pond dam and spillway have not been verified. With 280 acres of urbanized drainage area, this pond is an excellent example of a degraded surface water feature with opportunity for retrofit for water quality and habitat improvement. The pond is currently maintained by mowing to the pond edge, which has led to some bank erosion, loss of riparian habitat, higher water temperature, and an abundance of Canadian geese. Algae blooms during warmer months due primarily to excessive sedimentation and organic enrichment from pathogens and nutrients reduce dissolved oxygen, harm aquatic fish and organisms, and make the park a nuisance to local residents. Vaughn’s Branch and Big Elm Tributary, both tributaries of Wolf Run, merge within the Picadome Golf Course in Lexington, Kentucky. The Big Elm Tributary ends at a large sinkhole located on LFUCG Picadome golf course property, with overflow continuing across the golf course until it enters Vaughn’s Branch. Both streams are FEMA-regulated floodways; however, due to the heavy karst influence in this area, these tributaries are dry during “low-flow” conditions. Due to increases in peak flow and duration as well as numerous bridge crossings, some segments of these streams are highly eroded and destabilized, experiencing active deposition, scour, and meander development. In addition, a large amount of trash and debris collects at the mouth of the Big Elm Tributary sinkhole. Monitoring data shows that Vaughn’s Branch has some of the highest levels in the watershed of non-point source pollutants including phosphorus, nitrogen, pathogens, conductivity, and sediment. Habitat was found to be “poor” due to low velocity-depth regime, channel flow, bank stability and riparian vegetation. LFUCG has completed pebble counts, longitudinal profile and cross-sections of the stream as part of the Wolf Run Watershed Based Plan. This project focuses on meeting the following goals: (a) reduce streambank erosion and improving aquatic habitat on the Big Elm Tributary and Vaughn’s Branch, (b) perform sinkhole remediation to reduce flooding and surface rill and interrill erosion, and (c) improve water quality by capturing trash and debris, providing for a native riparian buffer zone along more of the stream channel, and providing water quality treatment to enhance pollutant reductions.